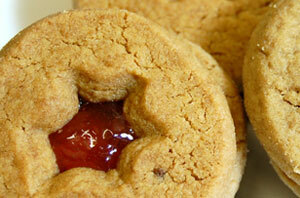 This crisp peanut butter biscuit is perfect for National Picnic Week, which will be celebrated in UK from June 17-23. Prepare and grease 3 baking trays. Using a bowl, mix peanut butter, sugar, and butter. Add flour when the mixture is already well blended. Divide mixture into 2. Roll each piece on a floured surface into a cylinder shape about 10cm/4 inches long. Cut each roll into 8 slices using a large sharp knife. Using a mini cutter, make a small hole in the center of 8 of the biscuits. Place the biscuits in baking trays making sure that they are well apart. Bake for 10-13 minutes. Remove from the oven and add jam on top of the biscuits that do not have holes. Allow to cool for 5 minutes. Place the holed biscuits on top of the ones with the jam. Transfer to a wire rack to completely cool and harden. This recipe is from http://www.recipes4us.co.uk/.